Praia do Bode Beach, Fernando de Noronha, Brazil. 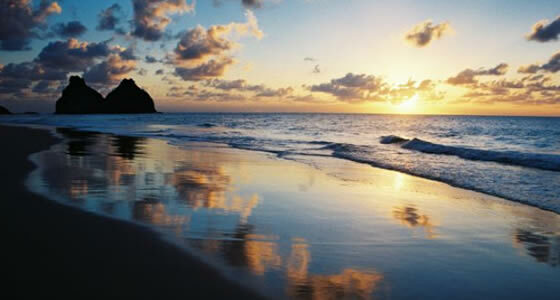 Praia do Bode is the output source to all the other beaches on the island of Fernando de Noronha. Praia do Bode beach is locally called the goat’s beach. To get to this beach you have to go through an old stony path. This is a very user friendly beach, where you can just chill out and enjoy the green surroundings. Praia do Bode has some nice spots where you will find good shade under the trees, so you can take a quick nap or just bask in the cool shade. The sea is mostly calm here and there are some natural stone pools which are great for swimming. The Goat’s beach is marked as a starting point from where the trekking adventures begin. One of the main attractions of this beach is a huge stone. The native’s call it ‘bode’. It is a look out spot from where you can take in the marvelous view of the sunset. The beach is not very crowded. People visit this beach just to relax and swim in the waters, so it is best to visit this beach after an adventurous day to just relax and wait for the picturesque sunset view.